Uffcott, Nr Wroughton, Wiltshire. Reported 22nd June. 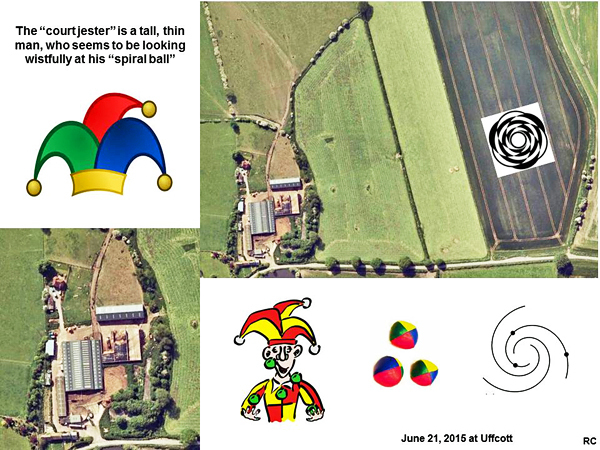 When I reviewed the set of crop circle images reported from June 16th through to June 22nd, I couldn抰 help but feel that these images, in the sequence they were reported, compose a sort of graphic running commentary about what is happening to Earth in this time. The comments of John of CA about the Ravenna and the Westwoods formations are what triggered my thought. I was actually contemplating the Green Street formation as I perused what had been said about the formations in June so far. It seems to me that the six formations: Blackhorse Lane, Green Street, Ravenna, Westwoods, Uffcott and Groziethen together tell a beautiful story in the life our changing planet! Prologue: The Earth square inside a circle womb! Is Earth to be the cellular material transformed by cosmic events? Once upon a time there was a planet Earth (square) in all her beauty and stability, with a centre core (circle) reflective of the infinite cosmos (larger circle). All was good, but things began to move in relation to Earth. Something was on the verge of change! Far far away, Great Sun became more and more active; it was the solstice of summertime and Sun always relays stronger energy to Earth in summer! The great planet Jupiter can deflect or sometimes hide or absorb energies coming from space towards Earth. But somehow both these great bodies are involved in the energies arising this time. Earth receives gigantic forceful energies from the Coronal Mass Ejections. They are so strong that perhaps this time, the core itself is affected and there will be shuddering earthquakes as a result of the vibratory impact. Perhaps even phenomena like hurricanes, tornadoes or similar turbulent things will occur as a result of this energy intake. In the end Earth reaches another level of evolution having been transformed from a fourfold geometric into an eightfold geometric朼 final equilibrium. The saga is a tale of a transformation on a global level brought on by cosmic events that may cause disturbance, but ultimately result in a new, more balanced cosmic and, hopefully, global situation. Blackhorse Lane formation introduces the story with a promise in the form of a zygote-like image. 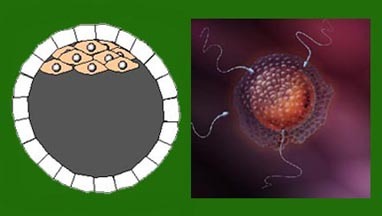 Green Street formation could be seen as an image suggesting fertilization of an ovum. Jupiter is the master, considered by the Ancients to be bringer of good fortune and healing. His number is four. So things are being re-organized and overseen by the great spiritual master planet. The coronal mass ejections, suggested by the formation at Ravenna, can be felt by Earth in spite of the protective magnetic field around Her. Under a barrage of highly intense ejections, the Earth may tremble to its core as she receives the impact (Westwoods), thus causing disturbances on the surface such as earthquakes and turbulent weather activity (Uffcott). 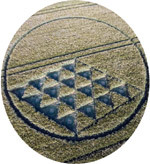 The crop circles could be warning us, as John of CA indicates, to be prepared if you live in a zone where these phenomena are common. This energy is also a transformative force. The Great Gas Giant Jupiter lies between the Asteroid Belt and Mars in our Solar System. It has the legendary ethos of being a benevolent and healing planet. 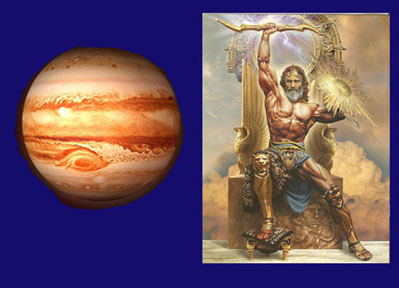 Jupiter/Zeus of mythology was a usurper of old kings and a creator of a new human race. 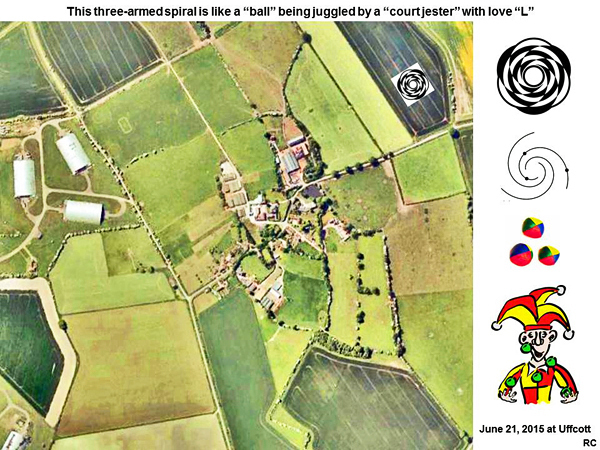 The pattern seen at Groziethen shows us a symbol of Earth having gone through rebirth and regeneration as was promised in the developing zygote design at Blackhorse. Here we see an eightfold geometric shape that still maintains the stability of the fourfold geometry of the square, but goes beyond basic square symbolism. The Christian baptismal font has an octagonal shape symbolizing spiritual death and rebirth. This cymatic eightfold pattern has some similarity to the Gorziethen formation. Sound vibrations create amazing patterns of unimaginable variety! The cosmic vibrations received by Earth could be creating amazing new things for us! 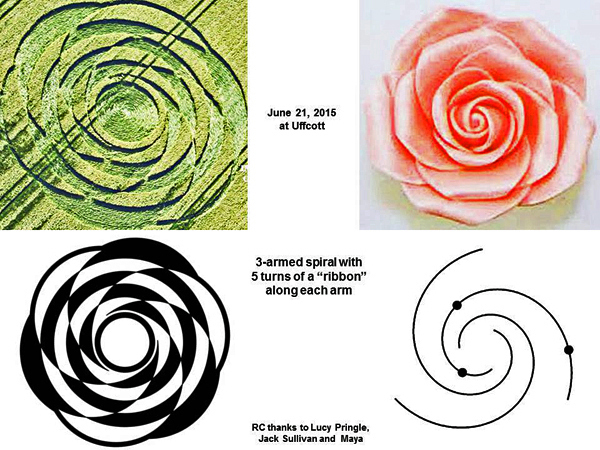 This ingenious chronology of crop circles gives us a wondrous story surrounding and encompassing our own lives in this present time on our beautiful planet Earth! Even the mushroom interpretation can be part of this story because not only do the events far off in the cosmos affect our lives here physically, but also mentally, emotionally and spiritually. Our new planetary story is being written before our eyes; sounded out as cosmic vibration; told beneath our feet! Julien, Nadia. The Mammoth Dictionary of Symbols. Robinson Publishing. London. 1996. Nozedar, Adele. The Element Encyclopedia of Secret Signs and Symbols. Harper Element. London. 2008. Walker, Barbara. The Woman抯 Dictionary of Symbols & Sacred Objects. Castle Books. Edison, NJ. 1988. Thank you photographers for the connector for the use of the thumbnails�.